Brenda Lee (born Brenda Mae Tarpley; December 11, 1944) is an American performer and the top-charting solo female vocalist of the 1960s. She sang rockabilly, pop and country music, and had 47 US chart hits during the 1960s, and is ranked fourth in that decade surpassed only by Elvis Presley, the Beatles and Ray Charles. She is known for her 1960 hit "I'm Sorry", and 1958's "Rockin' Around the Christmas Tree", which has become a Christmas standard. At 4 ft 9 inches tall (approximately 145 cm), she received the nickname "Little Miss Dynamite" in 1957, after recording the song "Dynamite" when she was 12, and was one of the earliest pop stars to have a major contemporary international following. Lee's popularity faded in the late 1960s as her voice matured, but she continued a successful recording career by returning to her roots as a country singer with a string of hits through the 1970s and 1980s. She is a member of the Rock and Roll, Country Music and Rockabilly Halls of Fame. She is also a Grammy Lifetime Achievement Award recipient. Lee is the only woman to be inducted into both the Rock and Roll and Country Music Halls of Fame. She lives in Nashville, Tennessee. Brenda Lee was born Brenda Mae Tarpley on December 11, 1944, to parents Annie Grace (née Yarbrough) and Reuben Lindsey Tarpley. Lee was born in the charity ward of Grady Memorial Hospital in Atlanta, Georgia. She weighed 4 pounds 11 ounces at birth. Lee attended grade schools wherever her father found work, primarily between Atlanta and Augusta. Her family was poor. As a child, she shared a bed with her brother and sister in a series of three-room houses without running water. Life centered around her parents finding work, their family, and the Baptist church, where she began singing solos every Sunday. Lee was a musical prodigy. Though her family did not have indoor plumbing until after her father's death, they had a battery-powered table radio that fascinated Brenda as a baby. Both her mother and sister remembered taking her repeatedly to a local candy store before she turned three. One of them would stand her on the counter and she would earn candy or coins for singing. Her father died in 1953, and by the time she turned ten, she was the primary breadwinner of her family through singing at events and on local radio and television shows. During that time, she appeared regularly on the country music show "TV Ranch" on WAGA-TV in Atlanta; she was so short, the host would lower a stand microphone as low as it would go and stand her up on a wooden crate to reach it. In 1955, Grayce Tarpley was remarried to Buell "Jay" Rainwater, who moved the family to Cincinnati, Ohio, where he worked at the Jimmie Skinner Music Center. Lee performed with Skinner at the record shop on two Saturday programs broadcast over Newport, Kentucky radio station WNOP. The family soon returned to Georgia, however, this time to Augusta and Lee appeared on the show The Peach Blossom Special on WJAT-AM in Swainsboro. On December 13, 2017 her famous Christmas classic "Rockin' Around the Christmas Tree" surprisingly showed up at #37 on the Billboard Hot 100. That song has not seen any chart action in the United States since 1961, although it is a favourite in the UK, regularly returning to the top 40 every year in recent times. On September 26, 1986 Brenda Lee was installed in the Atlanta Music Hall of Fame 5th Annual Awards Ceremony held at the Raddison Inn, Atlanta, GA. She was named among many other famous recording artists including Riley Puckett, Gid Tanner, Dan Hornsby, Clayton McMichen, and Boots Woodall to name a few. Lee reached the final ballot for induction into the Rock and Roll Hall of Fame in 1990 and 2001 without being inducted, but was voted into the hall for 2002. Celebrating over 50 years as a recording artist, in September 2006 she was the second recipient of the Jo Meador-Walker Lifetime Achievement award by the Source Foundation in Nashville. In 1997, she was inducted into the Country Music Hall of Fame and is a member of the Rockabilly Hall of Fame and the Hit Parade Hall of Fame. In 2008, her recording of "Rockin' Around the Christmas Tree" marked 50 years as a holiday standard, and in February 2009, the National Academy of Recording Arts and Sciences gave Lee a Lifetime Achievement Grammy Award. 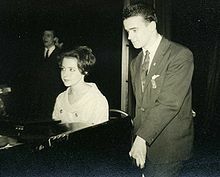 Although Lee's songs often centered on lost loves, her 1963 marriage to Ronnie Shacklett has lasted more than 50 years. Lee met Shacklett at a November 1962 Bo Diddley and Jackie Wilson concert at Nashville's Fairgrounds Coliseum and married him less than six months later, on April 24, 1963. Lee and Shacklett have two daughters, Jolie and Julie (named after Patsy Cline's daughter), and three grandchildren, Taylor, Jordan and Charley. Lee is also the cousin (by way of her mother's second marriage) to singer Dave Rainwater from the New Christy Minstrels. ^ a b c d Lee, Brenda; Oermann, Robert K.; Clay, Julie (2002). Little Miss Dynamite: the life and times of Brenda Lee. Hyperion. p. 305. ISBN 9780786866441. ^ a b c "Brenda Lee: The Lady, The Legend". rockabillyhall.com. Rockabilly Hall of Fame. Retrieved April 10, 2019. ^ a b "Brenda Lee: Biography". imdb.com. IMDb]. Retrieved April 10, 2019. ^ Bernstein, Jonathan (February 20, 2018). "Inside the Life of Brenda Lee, the Pop Heroine Next Door". rollingstone.com. Rolling Stone. Retrieved April 11, 2019. ^ Gray, Michael (December 13, 2001). "Brenda Lee, Chet Atkins to Join Rock and Roll Hall of Fame". cmt.com. CMT. Retrieved April 10, 2019. ^ "Brenda Lee (b. 1944) | New Georgia Encyclopedia". Georgiaencyclopedia.org. Retrieved August 17, 2015. ^ "Brenda Lee: Little Miss Dynamite". imdb.com. IMDb. Retrieved April 11, 2019. ^ "Brenda Lee: the Lady, the Legend". Brenda Lee Productions. Archived from the original on April 14, 2009. Retrieved April 10, 2009. ^ Murrells, Joseph (1978). The Book of Golden Discs (2nd ed.). London: Barrie and Jenkins Ltd. p. 103. ISBN 0-214-20512-6. ^ Bernstein, Jonathan. "Inside the Life of Brenda Lee, the Pop Heroine Next Door". Rolling Stone. Retrieved February 21, 2018. ^ "Brenda Lee announces signing with Webster Public Relations". April 11, 2017. Retrieved April 21, 2017. ^ "Brenda Lee - Rock & Roll Hall of Fame". Rock & Roll Hall of Fame. Retrieved November 18, 2016. ^ "Rock and Roll Hall of Fame and Museum | History, Facts, & Inductees". Encyclopedia Britannica. Retrieved October 11, 2017. ^ "2006 - Source Nashville". Retrieved November 18, 2016. ^ "Brenda Lee". Retrieved November 18, 2016. ^ "Brenda Lee - Hit Parade Hall of Fame". Retrieved November 18, 2016. ^ "Lifetime Achievement Award - Grammy". Retrieved November 18, 2016. ^ "Here Tonight". The Nashville Tennessean. November 4, 1962. p. 13-C.
^ "Singer learned young how to rock the house". Las Vegas Review-Journal. Retrieved January 3, 2018. ^ "Brenda Lee". Biography.com. Retrieved April 21, 2017. ^ "New Christy Minstrels to raise curtain in Brownville". Omaha World-Herald. Retrieved January 3, 2018. Argyrakis, Andy (July 5, 2007). "Reluctant Legend". Christianity Today. Retrieved April 2, 2008. Wooding, Dan. "'Little Miss Dynamite' returns to her Gospel roots with a little help from some of her best friends". ASSIST News Service. Archived from the original on July 14, 2014. Retrieved February 3, 2012. "Brenda Lee: the Lady, the Legend". Brenda Lee Productions. Archived from the original on April 14, 2009. Retrieved April 10, 2009. Wikimedia Commons has media related to Brenda Lee. This page was last edited on 11 April 2019, at 04:51 (UTC).